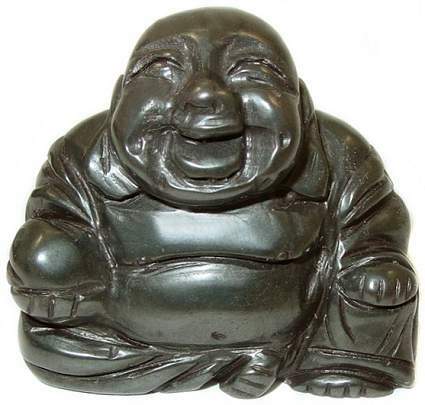 Sitting Hotai Buddha carving in shiny Hematite. Hematite has superb grounding qualities and is a "Stone of the Mind", enhancing mental attunement and original thinking. In Feng Shui lore, the sitting Hotai Buddha is used as a "Happy Home" cure, bringing wisdom, prosperity and happiness to the home. This stone is said to help with mental pursuits and keep confusion to a minimum. It is very helpful with technical pursuits as well as mental and manual dexterity. Hematite raises aspirations by removing negative subconscious emotions and barriers. It has been known to bring people closer to inner-happiness. Hematite is a shiny crystal material that has a luster and used to be used as mirrors. Mainly found in Lake Superior, Canada, Brazil, Venezuela, and England. It gets it's name from the Greek root "ema" meaning blood. If you drag Hematite across unglazed porcelain there is a red streak left in the mineral's wake.